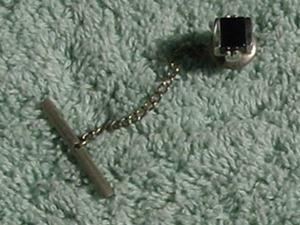 This vintage cube-shaped tie tack has a black center stone with silver-tone sides to hold it in place. Two of the sides are tulip-shaped and the other two completely cover the black center stone. 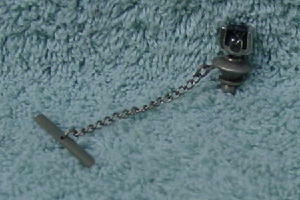 The chain, end bar, and back are not as shiny as the cube.